BEFORE: One of my classes this year is Media Criticism and Theory which focuses on critiquing various works of art, including film. That’s to say, there will be some overlap between that class and this blog. 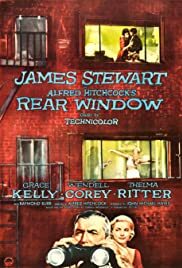 Rear Window is the first film we need to watch for the class and I’ll be using this opportunity to cross it off of my marathon list. Also of note, this is the first Hitchcock film of the marathon. AFTER: Hitchcock is known as the Master of Suspense and that is very true. The first Hitchcock film I saw, Dial M For Murder had me on the edge of my seat from the start. With Rear Window, it takes some time to buildup, but the end is just as suspenseful. Things start off very slow. The entire movie takes place from the point of view of L.B. Jeffries’ (James Stewart) apartment which makes it difficult to see how things are unfolding. And when you don’t know what is going on and how everything will come together, things can be a bit confusing. And in this case confusion led to boredom. Little did I know that the boredom was actually impatience on my part. I could try and say that this was intentional and Hitchcock wanted to evoke a feeling of boredom in the beginning because nothing was happening yet. But then that would go against my hatred of people who have to find meaning in everything so I won’t investigate that further. Hitchcock is now two for two in my book. I think I can say with confidence that if you are ever looking for a mystery or thriller to watch, pick anything Hitchcock has done and you’ll be entertained. I think Dial M For Murder is better than Rear Window but both are very well done.